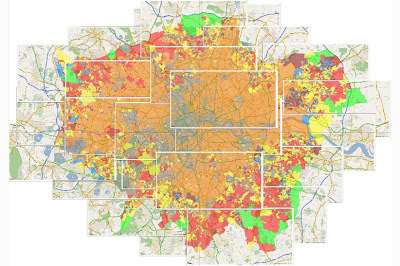 Using either our GMapCreator or any other Google Mapping application it is possible to create some stunning maps that would look good in either poster or large print format. This tutorial provides a simple method to carry out multiple screen grabs and image stitching to create high resolution output from Google Maps for such purposes. 1) A copy of a screen capture program that allows you to simply grab a ‘Window’ view, we recommend SnagIt by TechSmith, which is one of the best image capture systems out there and available for a 30 day fully functional trial. 2) PtGui – probably the most accomplished image stitching program on the market and again available as a trial or at 79 Euros for the full version. The concept is simple, screen resolutions are generally too low to capture an image suitabe for use in large print formats, as such if you capture multiple zoomed in views and then stitch each image to recreate an overview you can obtain a much higher resolution output. 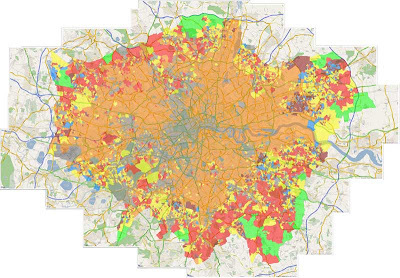 For this tutorial we used our London Super Output Areas Classification sample. Start at the top left hand corner of your chosen map and zoom in so you can start to see road names, this will differ according to your required scale but it acts as a guide for the level of zoom required. 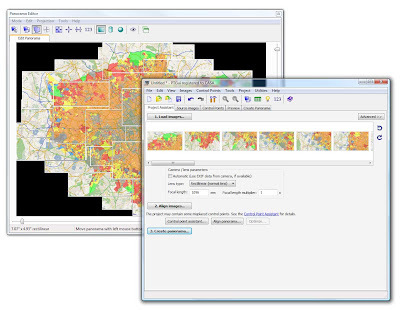 Open SnagIT or your preferred image capture software and set it to capture the map window area. Capture your first screen shot and save it as screen1.png or such like. Go back to Google Maps and move the map over to the right leaving approximately 25% of the first screen shot still in view, this is the overlap which will be used to stitch the images. Capture your next screen shot and save as screen2.png. Once you have previewed your map simply click ‘Create Panorama’ and export at your required size, we chose the ‘Maximum Size’ for our scene of 5990×4170 pixels. Creating the panorama will take approximately 30 minutes according to the number of screen grabs and machine used, our final .Tif came in at 71Mb which provides a high quality print on A1 paper. Note that all copyright and image credits should be reinserted into the final image as the stitching process blends out logos and overlays. Let us know how you get on…. I have created a simple tool to generate a Grid in Google Earth with placemarks in each cell center. Please check it out – hope it can help someone. With auto pano pro (http://www.autopano.net) you wouldn’t have to do any aligning. Just save all your overlapped screen grabs to a folder and it will autodetect their positions and overlaps and stitch them automagically. the only disadvantage is, that program is in russian language, BUT when you open program it has only one field for pasting link from google maps “link to this page”, and big Ok button. Going to London this weekend and have done all my preparations into Google Earth. I think stitching the several captures together was for me the easiest way to have an easy overview with all the information. In a more ideal world, i would have the nokia N95, but unfortunately; i don’t have the money to do so..
seems to be a little easier. Thanks Anonymous! Using the iFrame solution was MUCH easier!! BTW – It also works with Bing Maps, which don’t automatically turn on the Bird’s Eye (slanted) view. The Satellite view is much nicer for large maps. I should add, you need to use Screen Grab (fix version) since the original screen grab no longer works. And you use the url labelled “Paste HTML to embed in website”, copy into notepad, adjust the Iframe height and width e.g. set it to 2000 by 4000, then rename as html, open in browser and use the zoom feature and drag to the right position. You can then Screengrab the whole image. use iframe with required “width” and “height” to open maps.google.com in needed size and use some web-screen capturing tool. This site has really helped me at work.. Took a while to realise that Ptgui can only see files types such as Jpeg, but managed to get a brilliant A1 drawing once the files were the same size. There is no additional tools/software required except a web browser.